With all of the media attention to the filth in the Church, as the Pope so rightly calls the Clergy sexual abuse of children, we forget that our Church contains saints as well as sinners. The Washington Post has a piece, American missionary brings solace to drug-torn Mexican region on a heroic Capuchin Priest, Father Dave Beaumont, who has been a missionary in Northern Mexico for over twenty years. 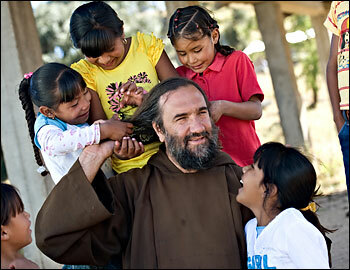 He serves in midst of drug cartels and terrible violence to the poorest of the poor. “The region now produces billion-dollar crops of marijuana and heroin. The U.S. State Department estimates that marijuana cultivation increased 35 percent in the Sierra Madre last year, despite the Mexican military’s slash-and-burn eradication efforts and the United States’ $1.6 billion Merida regional anti-narcotics initiative. In a single, record-breaking bust in October, Mexican authorities seized 134 tons of marijuana in Tijuana – worth $340 million – some of it likely harvested here. Often it falls to Beaumont to remedy this, providing food and medical help and a dependable presence to children whose own fathers are dead, or missing, or too drunk. For hundreds of families, he is both a spiritual father and a surrogate one. “How are you, my children? I am so happy to see you,” he says wherever he arrives. The son of a mathematician, Beaumont was an altar boy at 10 and joined the priesthood at 15, stirred by trips to St. Paul’s Cathedral in New York City. He was working as a missionary in South Central Los Angeles, helping Central American refugees, when his superiors in the Capuchin Order asked him to go to Yecora. This entry was posted in Catholic Church, Clergy, Holiness. Bookmark the permalink.